The following article originally appeared in Knitting International, Issue 2, 2015. The Tompkins USA family company is one of the oldest US manufacturers of circular knitting machinery and equipment. It was established in 1846 as the Empire Machine Co by Clark Tompkins. The name then became Tompkins Brothers and the company moved to Syracuse, New York, in 1914. It continues to occupy the same facility the company built in 1919, which was expanded to 33,000sq ft with a major addition in 1980. Tompkins USA designs, manufactures and sells a proprietary line of circular knitting machinery and equipment to the textile industry worldwide. The company has positioned itself for expansive growth by focusing on continued product development of a full range of machines from 3in to 26in in diameter. Tompkins offers R (rib) Frame Size I for diameters 3-7in, Frame Size II for 8-13in, Frame Size III for diameters 14-19in and Frame Size IV for 20-26in. The J series produces jersey, lacoste, and terry. Frame Size I is for diameters 3-10in and Frame Size II and III for 11-26in. Tompkins said its USA niche is the ability to offer the customer faster, more consistent production and more flexibility with interchangeable diameters that fit standardised, more compact frame size machines that require less square footage for operation. Tompkins USA produces multiple diameters within a limited number of frames. From that the company designed, developed and produced circular rib and jersey machines 3-26in in diameter within four frame sizes. The company is threefifths of the way through this programme, according to general manager, Mike Mosher. With today’s lower energy cost in the USA, Mr Mosher sees manufacturing of many textile products returning to the country and has introduced a new machine series to meet anticipated demand. “We have introduced the Pro-Series, short for production series. These machines offer performance driven parts allowing for longer service life with increased roll capacity size. The company is also working on auto-doffing machines and a leasing programme for machines. The newly designed Tompkins Model SR07026C has replaced the B2E and B2E-4 circular knitting machines. The SR07, high production hockey stocking knitting machine was designed to meet the current industrial safety standards in Canada. The SR07 has six colour striping, allowing for more colour stripe combinations and quicker change over from product to product. 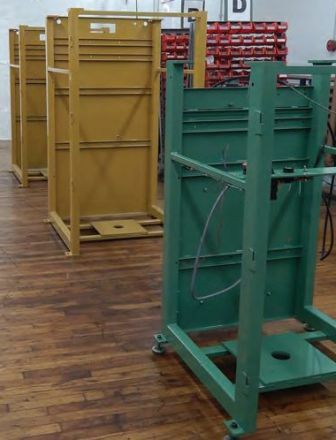 It is designed for use with a standard creel system, allowing for more efficient handling of yarn and quicker changeover from product to product. A redesigned HMI touch screen panel allows the operator to choose from six menus allowing control of design, programme storage, machine maintenance and monitoring of the machine and products it produces. The SR07 is said to be twice as productive as the B2E machine. Tompkins has several main markets. Its small diameter and body size circular rib machines can produce e.g. cuffs, hockey socks, contoured hose, bandages, turtleneck shirts and body size garments. The small diameter jersey and body size jersey machines produce products such as food packaging, high definition meat netting, erosion control, drain pipe sleeves, compression bandages, oil boom sleeves, suspended culture mesh bags and body size garments. Tompkin’s small diameter size circular terry machines produce boot liners, head and wrist bands and repair liners for sewer pipes. For Tompkins machines, the company can produce cylinders, dials and sinker rings in two weeks. It aims to supply cylinders, dials and sinker rings for other machines in three to four weeks. Mr Mosher said he sees potential growth for this market as business continues to return to the US. During difficult times in the US market, Tompkins said it focused on designing a machine series that will help customers be more productive with less labour. It also renovated parts of the 1919 factory to increase efficiency and capacity. Greener, lower energy consumption lighting has been installed throughout the factory. Tompkins’s business has steadily increased over the last few years. It has hired four new employees to meet increasing demand for its technology. The company plans to reintroduce its ‘Training School’. “As business continues to return to the US, the once trained knitting technicians have retired or have found different professions. It is important to continue educating the generations to come and to embrace ‘Made in USA’ once again,” said Mr Mosher. 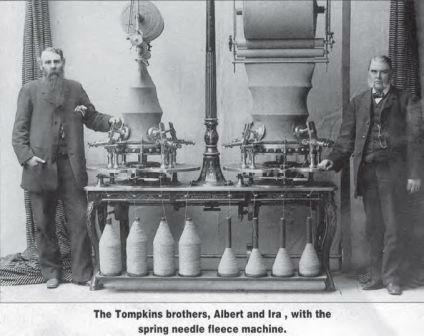 Knitting machinery made by the Tompkins Brothers is said to have a good reputation in the USA, Canada and South America. The firm’s cone yarn winder is a notable labour-saving machine. For the first few years of its existence, Tompkins manufactured looms for carpet and cotton mills, mill gearing and basic machinery. However, beginning in 1850, the output of the shop was expanded to include the many inventions that Tompkins began to design and patent. The superior design of the machine found a market not only in the many knitting mills of the Capital District, New York, but also throughout the US, Canada and South America. The frame revolved in the same direction as the take-up mechanism and the needle cylinder to produce a more uniform and elastic knit cloth with little human interaction and almost no noise. His winding bobbin machine automatically stopped when there was a break in the yarn, allowing an attendant to easily mend it and resume operation without having to adjust the bobbin. The original wooden building was destroyed by fire in 1849, but Tompkins rebuilt the shop across the street with brick on a much larger scale, measuring 175ft long by 45ft wide. The business was incorporated under the name Empire Machine Company and operated as such until Clark Tompkins’s death in 1877. His sons Albert and Ira assumed ownership of the business and subsequently operated under the name of Tompkins Brothers. The brothers continued the successful business for decades, as well as their father’s tradition of patenting new machinery for production and sale. Ira began by patenting an improvement in machines for napping and brushing knitted fabrics in partnership with his father in 1873. Later, both of Clark’s sons and a grandson named Ernest patented several dozen knitting machine improvements that were practical enough to produce and sell on the market. 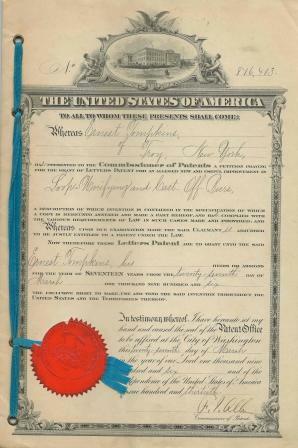 Ernest Tompkins became head of the Inventing Department, which contained a patent and technical library relating to advances in the knitting industry. The business was later relocated to Syracuse and continues to manufacture knitting machinery to this day under the name Tompkins USA.